It isn’t everyday you get engaged. And it isn’t everyday you eat a meal like the one you can enjoy at Alma. Yep, Trusty and I are enfianced! During an incredible meal at Alma he asked the big question. Because of the wonderful occasion and because of the delicious food it was a truly memorable meal. Food: The food was fantastic. Alma’s menu changes every 6-8 weeks, to offer new dishes that flavorful seasonal ingredients. 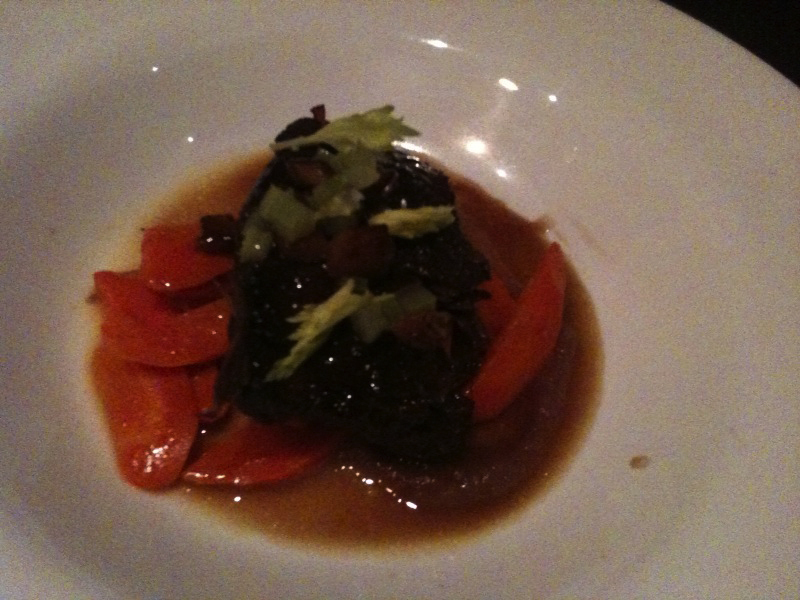 They specialize in three course tasting menus for $45 per person–not bad at all for a fine dining experience. 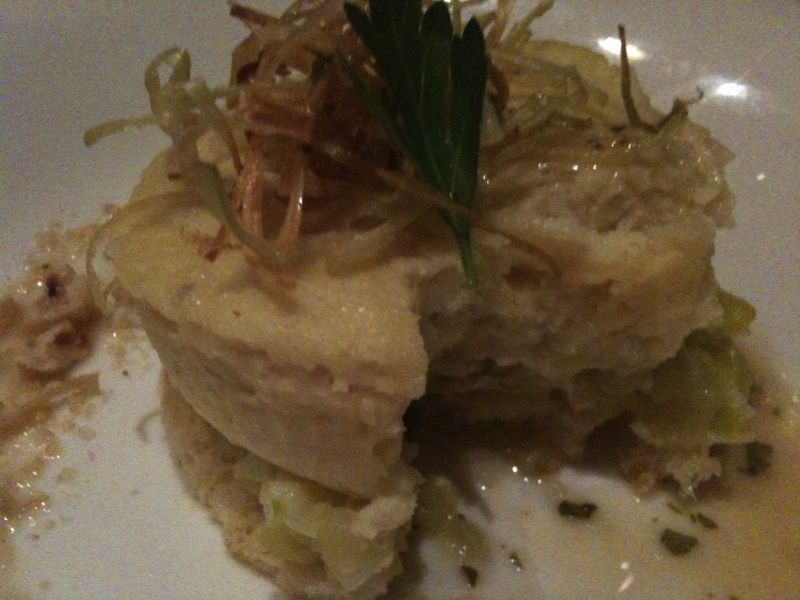 I started with a warm Celery Root Souffle ($14 a la carte). De-lic-ious! Great texture and flavors. I’ve never had anything like it. 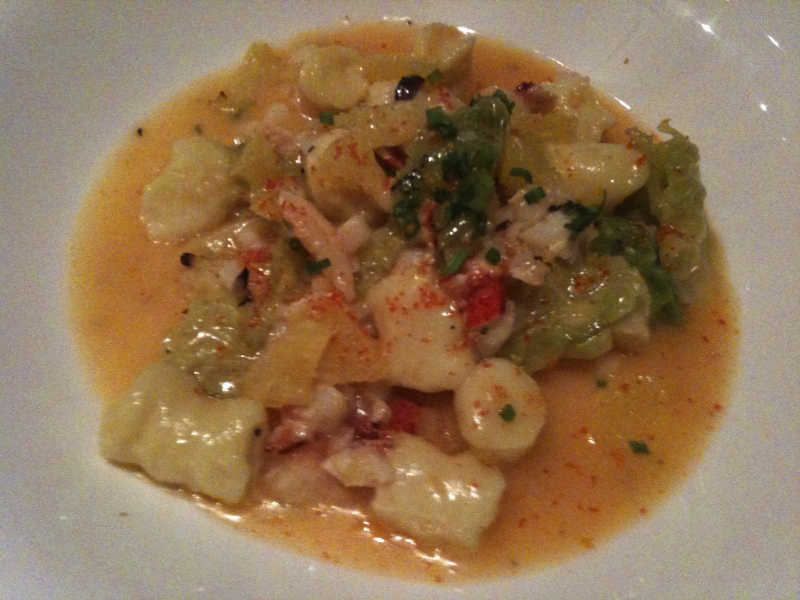 My second course was out-of-this-world amazing–lobster gnocchi ($17 for a la carte). It was fantastically rich and sweet, with giant pieces of lobster and a delicious orange truffle butter sauce. If we can get Alma to cater our wedding (fingers crossed), this will be on the menu! 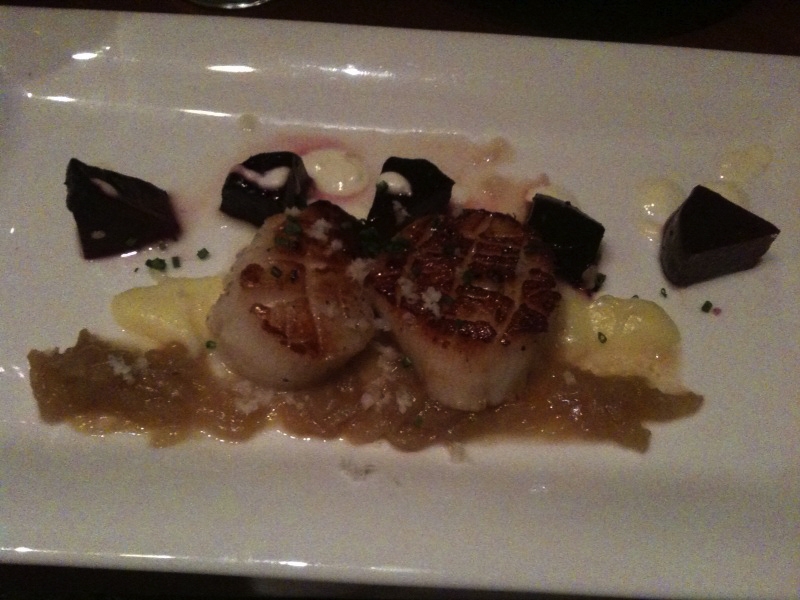 My third course was Pan Seared Scallops with caramelized onions and beets ($28 a la carte). 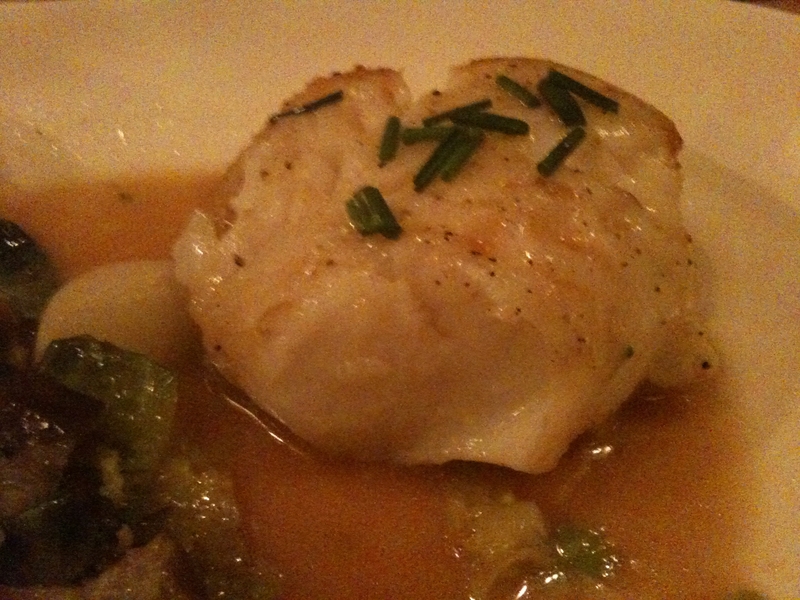 The scallops were seared to perfection–tender and sweet and soft. MMMMMMMmmmmmmmm. 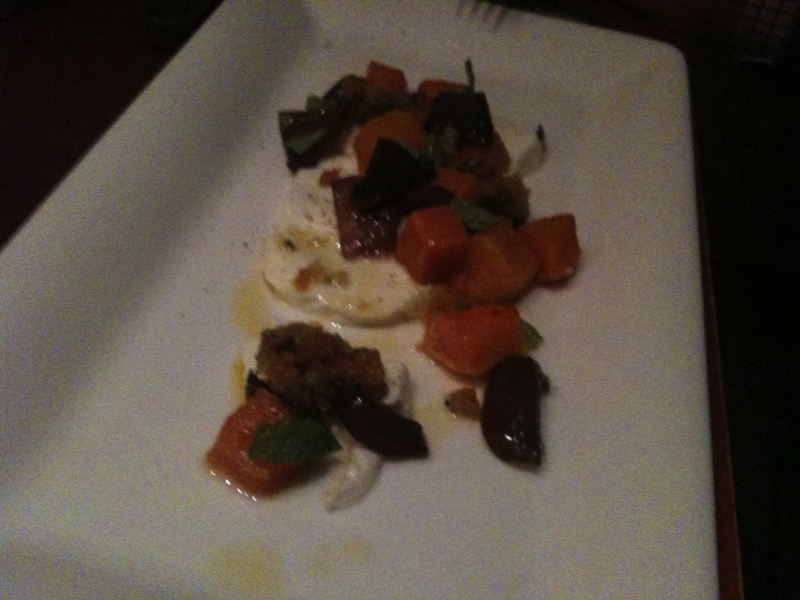 My Trusty Sidekick started with a Mozerella and Beet salad with fresh basil and a light balsamic glaze. It tasted as fresh as summer. 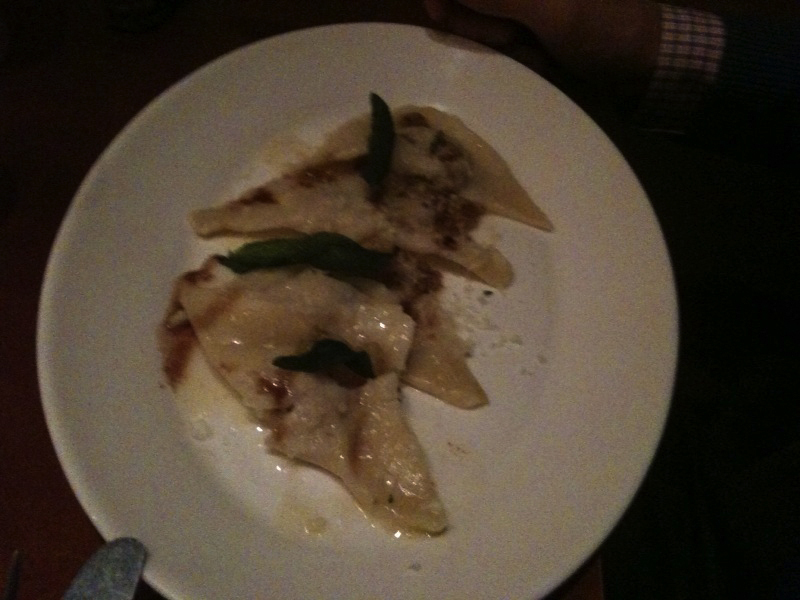 For his second course, he tried Glazed Beef Short Rib ravioli with fragrant and delicious fried sage leaves ($25 a la carte). 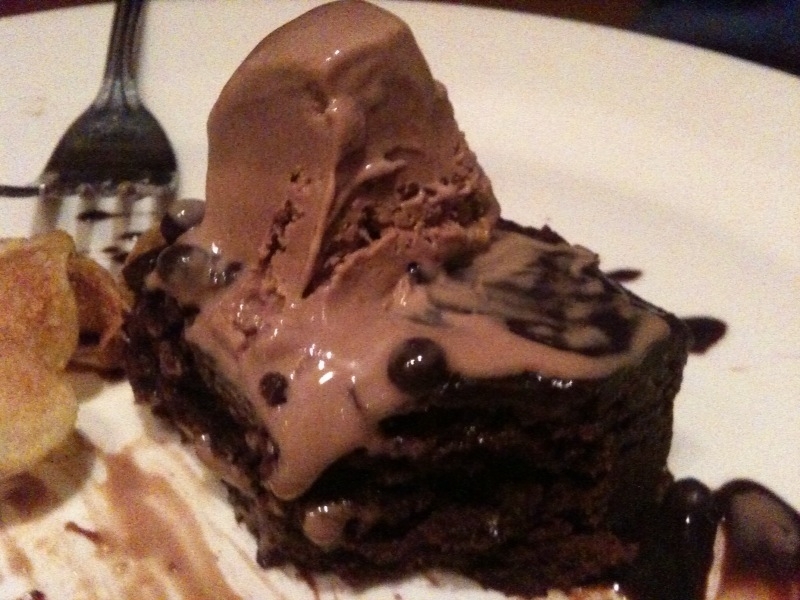 …but of course the evening called for dessert! 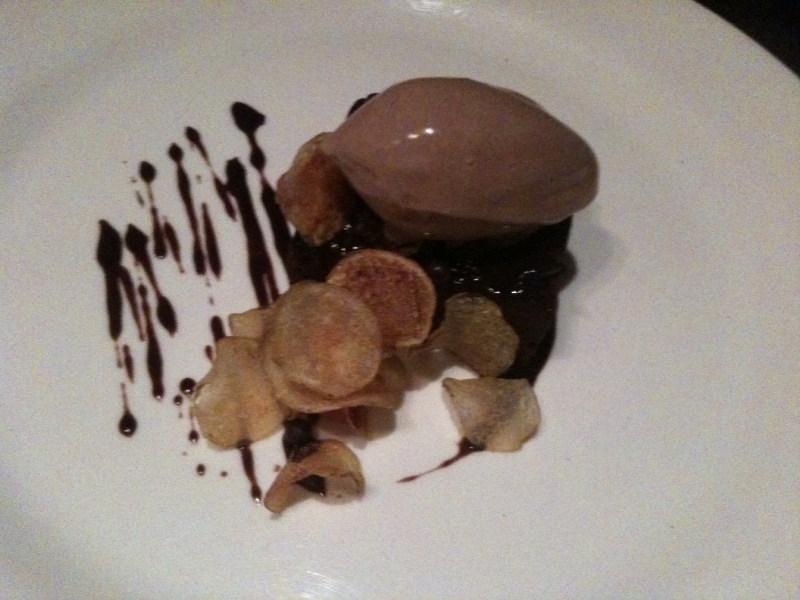 So, we split a chocolate tarte ($8) with chocolate sorbet and yummy, homemade potato chips. It was an amazing combination of sweet and salty. What a sweet end to the meal. Drink: As soon as our waitress figured out Trusty had just proposed, the matre d’ graciously sent over two glasses of champagne during dinner, and two glasses of Pacific Rim Framboise, NV, Washington during dessert. I usually don’t like Framboise–it can be cloyingly sweet–but this vintage (if that is the appropriate term) was delicious. I also enjoyed a delicious glass of rosehip herbal tea called “Bliss” at the end of the meal. Service: Our waitress was fantastic, and the entire staff was so warm and welcoming. Alma’s hospitality was memorable–we’ll be back soon to enjoy their service again. Scene: Because we went during an epic snowstorm the restaurant was literally empty! Trusty had called ahead to ask if we could be seated in a back, quiet corner of the restaurant, and when we arrived the Maitre d’ somewhat comically led us through Alma’s front room, which was empty, through their back room, which was also empty, and seated us at the very back corner table. When our waitress came over she informed us that the chefs were cooking for us. What an incredible evening. Cost: Our meal came to a little under $150 with tax and tip. My Trusty Sidekick and I have been trying to watch the budget lately–something that’s not always easy to do in New York. It’s been about five weeks since we’ve gone out to dinner, so, we decided to splurge a little in the name of Date Night (some of the best words in the English language) and try Recipe, a “recently opened” restaurant (as of May ’09) on the Upper West Side that we had heard great things about. Recipe is billed as a New American cuisine, but this isn’t quite right; it’s more like New American prepared by Grandma, if that makes any sense. Recipe’s menu features local, sustainable, and seasonal ingredients in rustic, comfort food interpretations of New American. The menu features tons of market-fresh vegetable and seafood options, as well as slow-cooked rotisserie fare. Basically, it’s homier and heartier than your typically clean and contemporary New American cuisine. While we were a little disappointed with the pace of our meal (more on that later), it was a delicious dinner. We’ll be back…as soon as we’ve saved up enough money for another night out. 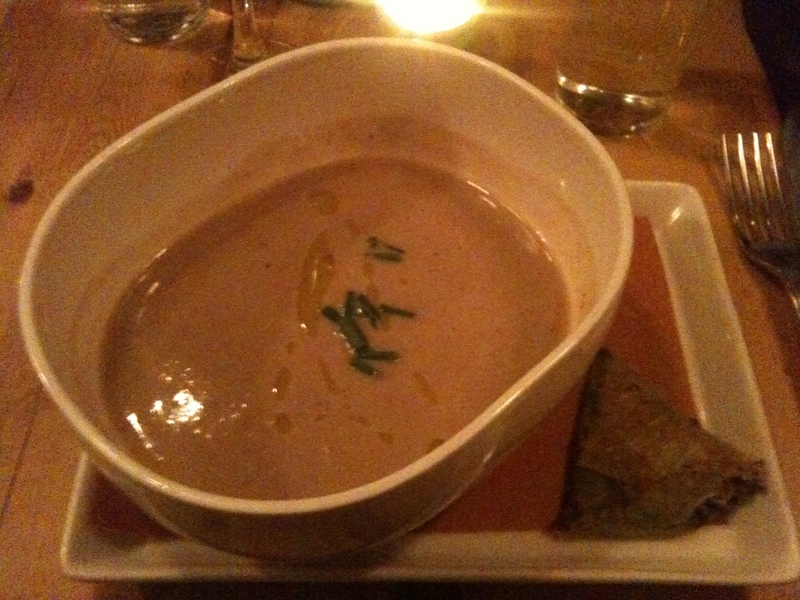 Food: Tons of appetizer options caught my eye, but I couldn’t say no to the Soup of the Day, which was a Parsnip and Chestnut puree served with a Spinach and Feta Spanakopita ($7). I wasn’t sold on the combination of the soup and spanakopita, but separately they were each very tasty. The combination of parsnips and chestnuts made for a creamy soup was full of fresh flavor and had an incredibly satisfying texture that was thick but extremely smooth. Love the generous portions here. 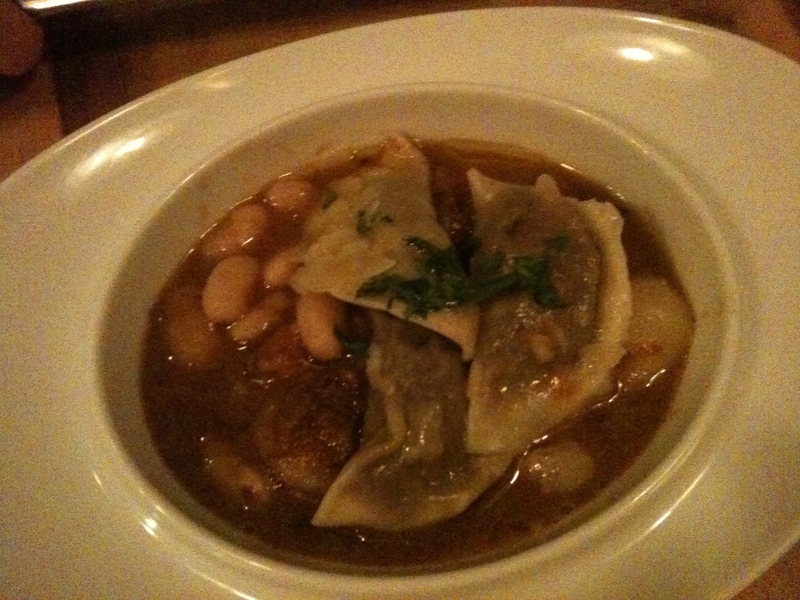 Trusty went with the Short Rib Tortellini ($11) and raved about the rich, hearty dish. Basically, it was delicious comfort food. 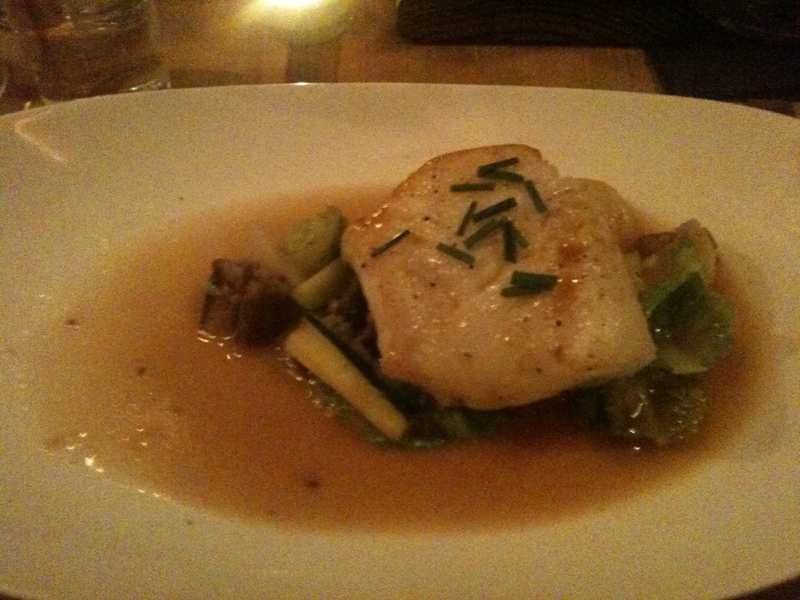 For my main course I tried the pan seared sea bass with brussel sprouts, eggplant, zucchini and a sweet and sour apple cider vinegar sauce ($22). The fish was cooked perfectly–it had a great, golden crust on the outside and was tender and flakey inside–and, the light and tangy sauce paired well with the delicate sea bass. I was disappointed with the veggies. Specifically, the fish was supposed to come with brussel sprouts, but this was a little misleading–there wasn’t a single whole brussel sprout, rather, under the fish were a few brussel sprout leaves. C’mon Recipe. For $22, you should spring for 4 or 5 whole brussel sprouts per plate. I love that Recipe garnished the fish and soup with fresh chives. 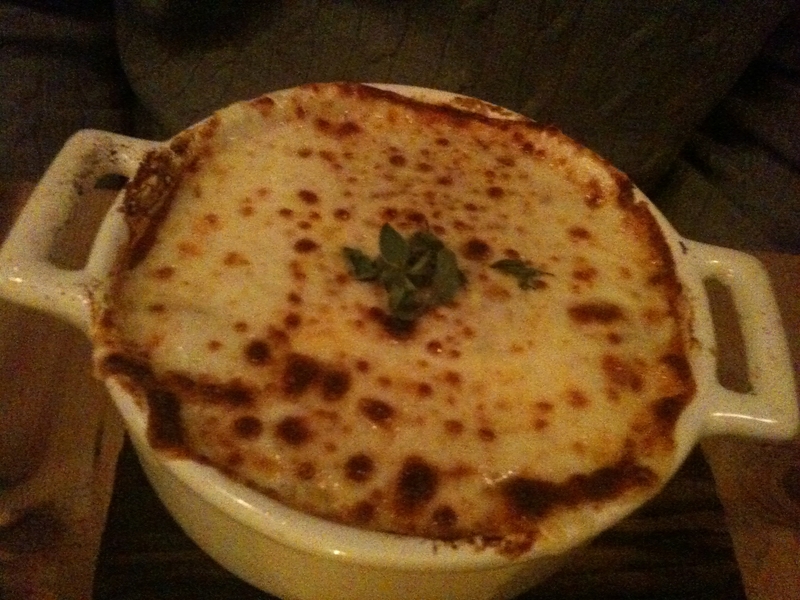 For his main dish Trusty went with the Winter Lasagna, full of seasonal root vegetables including carrots, parsnip and squash, as well as eggplant, all nestled in a rich tomato sauce beneath a bubbling layer of fresh mozzarella cheese ($18). Yum, yum, yum. I got to try a few bites of this dish and would definitely recommend it. Yep, that cheese says it all–this is true comfort food. 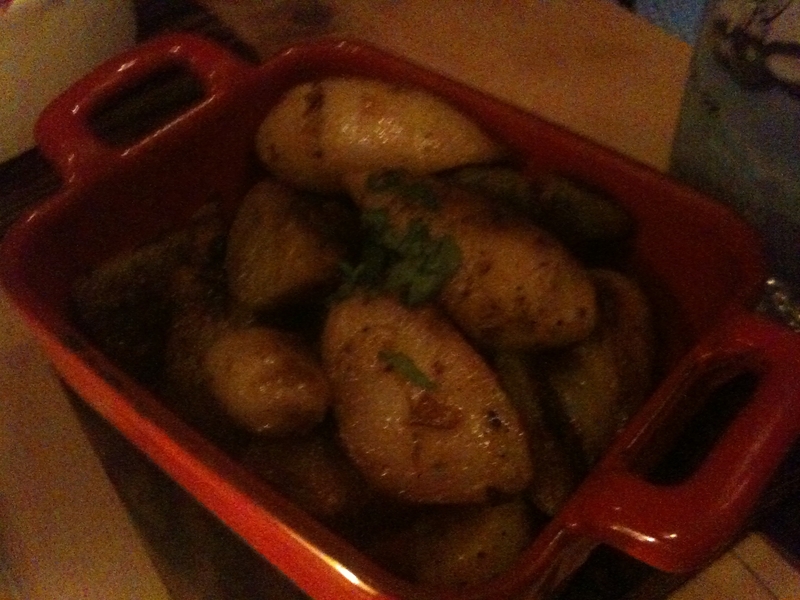 As if we didn’t have enough food, we shared a side dish of roasted winter squash and fingerling potatoes ($5). Simple and delicious, these veggies had great carmelized, roasted flavor. This is the best part eating a restaurant that uses local, seasonal ingredients: everything is fresh and flavorful, even when prepared in the simplest way. 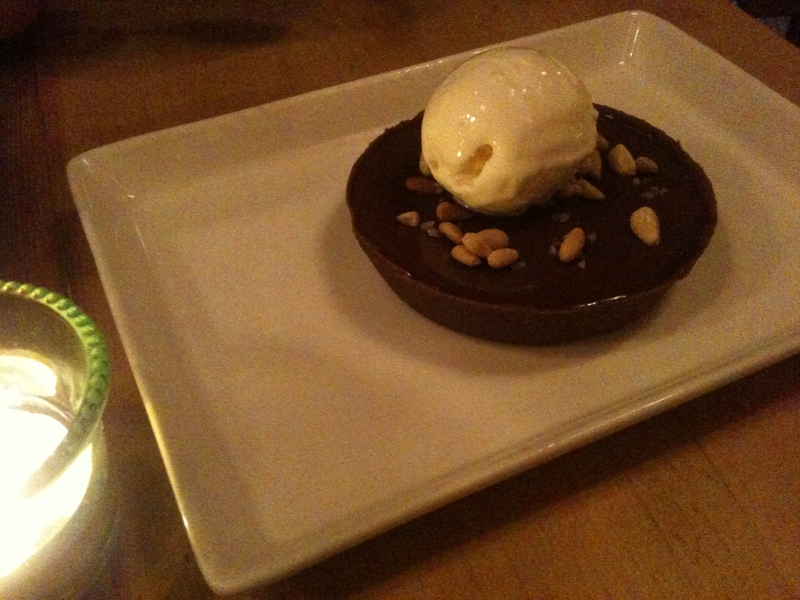 For dessert we split the Chocolate Pignoli Tart ($8) which was divine. Definitely a must-have at Recipe (you’ll thank me later), and more than enough to share between two. The dessert was a great combination of sweet and salty–it had a crunchy chocolate crust, a layer of buttery, sweet and salty caramel followed by a layer of thick, rich chocolate mousse. Sprinkled with roasted pine nuts and a few grains of sea salt and topped with a sweet, creamy, melty marscarpone gelato, this tart was an amazing end to our meal. Drink: I had a great glass of Paul de Coste Blanc de Blanc Brut ($10) that was delicious with my fish. Trusty tried the Dixie Blackened Voodoo Lager ($5) which was a light dark beer–not too heavy–and went well with the Short Rib Tortellini and Lasagna. Like their regular menu, Recipe’s drink menu was small, but full of well-selected items. If you’re trying to save money on your drinks tab, try one of their beers–all are $5. Service: Our waitress was friendly and the wait staff kept our water glasses full. We had a strange complaint: the service was actually too quick. It wasn’t that we were rushed, it was just that the courses were served at a very brisk pace and when you’re going out for a nice dinner you want to savor the experience, linger a little over the appetizer, then the entree. You also need a few minutes between courses to digest a bit. With each course coming back to back, we felt as though we finished before we had a chance to enjoy the meal. 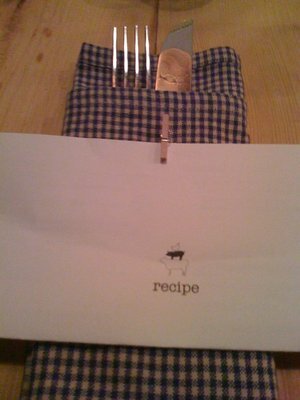 The mini clothespin that grasps the menus at Recipe is a great rustic detail. Scene: Recipe is a tiny, sliver of a place–basically it’s a long, narrow room with seating for only 20, maybe 25 if you count seats at the bar (be sure to make a reservation before you go). 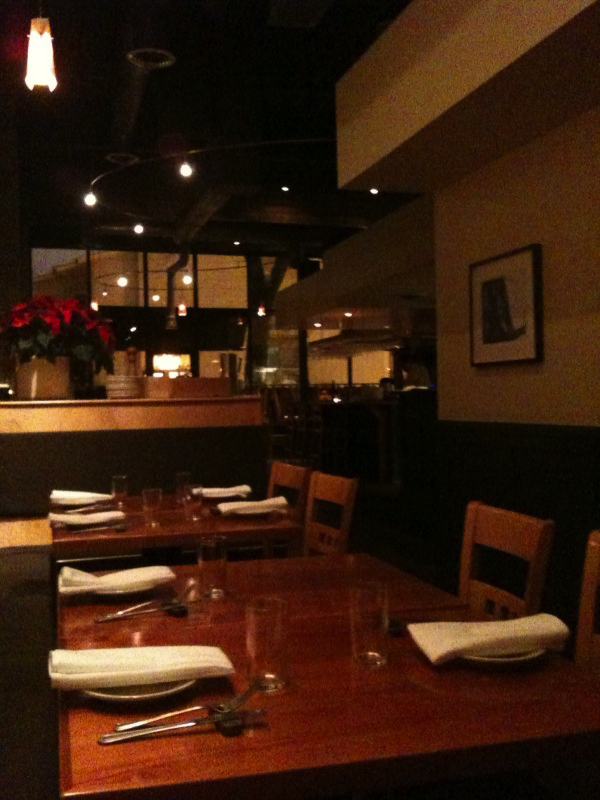 As a result, it’s an intimate, cozy space that lends itself well to dates or dinner with a close friend. This isn’t a great place for groups. The wood block tables and chairs, with simple white tile backsplash, gives Recipe a rustic, homey feel that works with the restaurant’s menu of local, sustainable “New American” comfort food. Dress: Casual chic is very safe here. Delivery: YES! Download their delivery menu from their site. Cost: With tax and tip our bill came to just over $100. Not bad for a nice night out in New York. 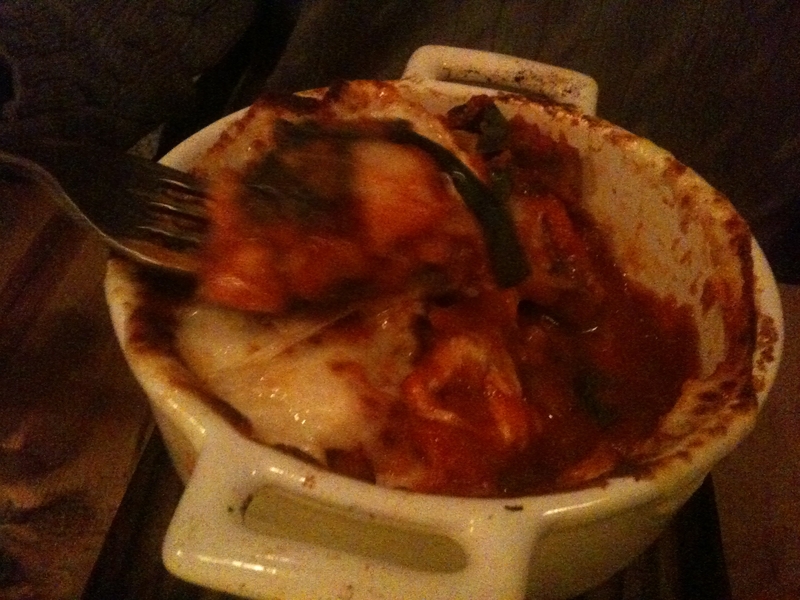 And with the generous portions, we felt like Recipe offered good value.